On researching some things about the Old West, I ran across a very interesting article about the old 80's movie The Legend of the Lone Ranger. I remember this film well, mainly because I was very excited about it's release.....sort of like I was with the latest, Disney, offering. I don't remember being as disappointed in the 80s version as I was with the newest release, though. Anyway, I found the article extremely interesting because it mainly discusses the star....a relative unknown named Klinton Spilsbury and how he, pretty much, came out of nowhere to get the role (because he 'looked good in the mask') and then disappeared just as quickly afterwards. Sort of like character he portrayed, in some respects. I had fond memories of this movie growing up and remember the hullabaloo surrounding the film and how the studio treated Clayton Moore (the original, t.v. Lone Ranger) so poorly, when all he wanted to do was continue wearing the mask and talking to fans. Apparently, that backlash really hurt the film. Probably more than the poor performance and prima-donna attitude of Spilbury who, as the legend also tells, had his voice dubbed by another actor. Even such big name stars like Jason Robards and Christopher Lloyd couldn't help ticket sales. While the film was a marketing success (from what I've read), it still did terrible box office to the point that no one was interested in picking the property back up until Disney decided to give it a go. In my opinion, they should have just let sleeping dogs lie. Can you tell that I really hated Disney's Lone Ranger?? I also found the entire movie on YouTube and am going to give it another watch. I haven't seen it in over twenty years so I'm interested to see if it still holds up and is still a better Batman than Ben Affleck. Oh wait....that's a post for another day. Ben Affleck was Batman? Yes, you better post and e'splain that! I'll watch the latest version on NetFlix. I enjoy a good train wreck now and then. I remember that movie when it came out too! And no matter how much I adore Johnny Depp, I just can't bring myself to see the new Lone Ranger film. As for Ben as Batman... was the casting director drunk? Like you said, Marty, sometimes it's better to let sleeping dogs snore. I'll have to check it out on Netflix. I'm not sure what's going on with Disney, Lone Ranger & Planes were both box office flops. I heard the hoopla about Ben as Batman. I'll withhold comment until I see the end result. @Christine: I'd definitely wait for Netflix and, yes, I think there might have been some drinking (as well as other stuff) being passed around during that casting session...lol. I didn't see the Disney version of The Lone Ranger. Looks like that actor was a one hit wonder, huh? When I heard about that asshat Affleck being picked to play Batman I went ballistic. If you ask me, he wouldn't even make a good Robin. It makes me so mad just thinking about it. Grrr! I don't have memories of any version of the Lone Ranger, but from this post, it seems like the original series is where it's at. Law of diminishing returns? I don't remember the 1981 movie. I used to watch the old B&W show though. I remember that movie and that I liked it. I was excited about the new Lone Ranger but didn't go see it since so many people said it was terrible. I wonder what ever happened to Spilsbury? I haven't seen the new movie yet and like others, will wait until it comes out on DVD. I've heard bad, bad things about the movie. Of course I never had high expectations for it. I vaguely remember watching the TV show when I was little but the whole franchise just doesn't do it for me. I wonder if Spilsgbury regretted his prima-donna attitude when he realized he ruined his career. @Diane: I don't think it lasted too long in the theaters as three weeks later Raiders of the Lost Ark came out...lol. Actually, I'm watching it on YouTube as I'm typing this up. It's not too bad, to be honest. @Susan: I wish I would have waited for DVD or Netflix, to be honest. @Julie: Legend has it that he disappeared and never acted again. A magazine did manage, supposedly, to get ahold of one of his family members who told them Spilsbury had no desire to talk about the movie, at all. @S.P: I think that was a part of my problem with the new one...I had some pretty high expectations. None of which were fulfilled, unfortunately. didn't see either, although movie fatigue for me is high this summer. I enjoy Depp, but this looked like a pass. Also, KARL URBAN FOR BATMAN!!!!!!!!!! !...Sorry. I keep asking myself how many remakes can they do. But I guess as many as they want. 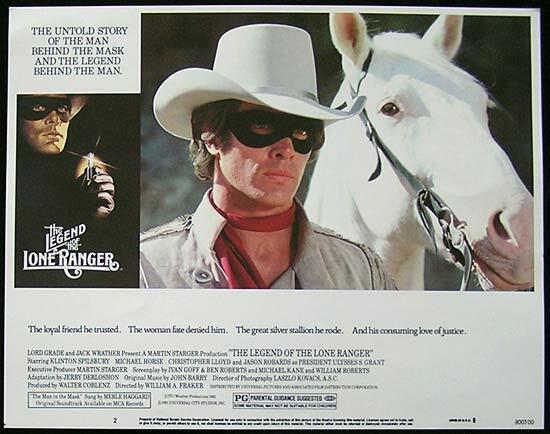 I never saw that 80's version of the Lone Ranger. The guy does look great in that mask! It's weird, I don't remember this at all and I was totally obsessed with movies back then. I thought I knew all that came out but I guess not LOL. I used to really like Johnny Depp but this latest Lone Ranger fiasco probably turned me off for good. Just awful. I reckon you've been anxiously waiting for a comment from me. Yes? No? Who is this guy? I vaguely recall the movie, "The Legend Of The Lone Ranger." I'm not sure I would watch it again. The latest movie version has now hit the movie screens in Britain. I shall not be going to watch it. Instead, I'm going to cut my grass. The Lawn Ranger rides again. A good week to you, my friend. Didn't see the new movie. I know I've seen it in black and white though. Was that a serial? I can't remember. That's funny. I'll stick with the radio shows. I didn't go see Lone Ranger because it wasn't my kind of movie (not even Depp could change my mind) and now I don't regret it. Heard at Ben being the next Batman last week. Not happy but I do hope if they're really doing a version with an older batman (that's what the report claimed anyway) it will be something like the animated series with the teen batman Terry.